When it comes to nuclear war, it makes sense not to leave it within the ability of a single person. By Scott Wagers/US DoD. As evidence mounts that Germanwings flight 4U9525 was crashed deliberately by its co-pilot who locked the flight’s captain out of the cockpit, there have been renewed calls to enforce a “two-person rule”, where two members of the flight crew are on the flight deck at all times. Within hours of the crash, steps were taken to enact this: the Canadian government made it a mandatory requirement, and the UK Civil Aviation Authority urged UK airlines to review their rules, although some airlines including budget airlines Ryanair and Flybe already enforced the rule. 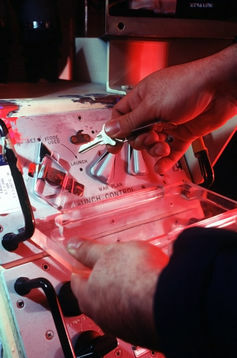 The idea dates back to the days of the Cold War, where two operators were required, typically with two separate keys, for drastic action such as launching nuclear weapons. The procedure is still in force today, to offer protection against the actions of rogue individuals. But the concept of the “buddy system”, that tells us not to be alone during critical or risky moments, is widely in place – from divers heading underwater, firefighters entering burning buildings or bankers making large withdrawals, and to school-aged children wandering out of sight of adults. In essence, the safety and integrity of actions and environments is improved by requiring the co-operation of two at a time. This way no single individual will be caught without help should they need it, and no one will be in a situation where the actions of a single person in a key role go unmonitored. While co-pilot Andreas Lubitz may have considered his actions, it’s likely that he moved on the spur of the moment – on quite a short flight there was no way of knowing whether the captain, Patrick Sonderheimer, would have needed to visit the toilet, leaving him alone in the cockpit. But it’s clear that being alone in the cockpit was all that was required for Lubitz to take himself and 149 others to their deaths on the slopes of the French Alps. Had the captain or any other member of the crew been there, they could have reversed any efforts to override the autopilot, or summoned other crew or passengers to help subdue Lubitz if necessary. As it’s impossible to require that neither of the pilots leave the cockpit during flights, adopting the two-person rule seems to be a good move in order to increase the safety of flights from the potential for actions such as this, or in the event that the remaining pilot is incapacitated, perhaps by a heart attack. Current measures protect from actions outwith the cockpit, but provide little defence from those coming from within. Had Sonderheimer been replaced by a member of the cabin crew that morning, would Lubitz have believed that he had an opportunity to do what he did? The two-person rule, more than only enforcing, also dissuades and serves as a deterrent. Undeterred, a pilot set on crashing their aircraft could still override the autopilot, but – except in situations where they were able to overpower their fellow in the cockpit quickly – it would only be a matter of time before it was detected, reversed, or the absent pilot was able to return to the flight deck. So it’s perhaps surprising that the two-person rule is not mandatory in the aviation industry worldwide but is left up to individual authorities. In the US, the Federal Aviation Administration made two in the cockpit a requirement a year after the 9/11 attacks in 2001 – along with the flight deck door reinforcement that contributed to the crash of flight 4U9525. The experience of those airlines that have adopted the rule is that it requires minimal effort or organisational change. All that is required is that a cabin crew member takes the absent pilot’s place in the cockpit, and may leave only after they return. It is an easy fix with the potential to prevent cases such as this – a similar Egyptian Airlines incident in 1999 left 229 dead, and there have been at least eight other “pilot suicides” in the last 40 years – as well as other situations that could arise. It’s clear that this has been rapidly taken up by airlines outside the US in the last 24 hours: EasyJet, Virgin, Air Transat, Emirates, Norwegian Air Shuttle, Air Canada, Air New Zealand and Lufthansa, the parent of Germanwings, have all announced they would implement the two-person rule. But ideally this would be adopted as a mandatory procedure worldwide – and sooner rather than later – as it can be done almost without cost, and with the potential to prevent the repeat of such tragedies. This article was originally published on The Conversation. Read the original article. ← Previous Post Russia can count on the BRICs… to say nothing. Next Post → What do Brazilian Admirals want? Not a quiet expansion!